The mute swan is a large member of the water fowl family Anatidae. It is native to much of Europe and Asia and is rarely seen in upper North Africa as a winter visitor. The mute swan was also introduced into North America, Southern Africa and Australia. The name ‘mute’ derives from it being less vocal than other swan species. 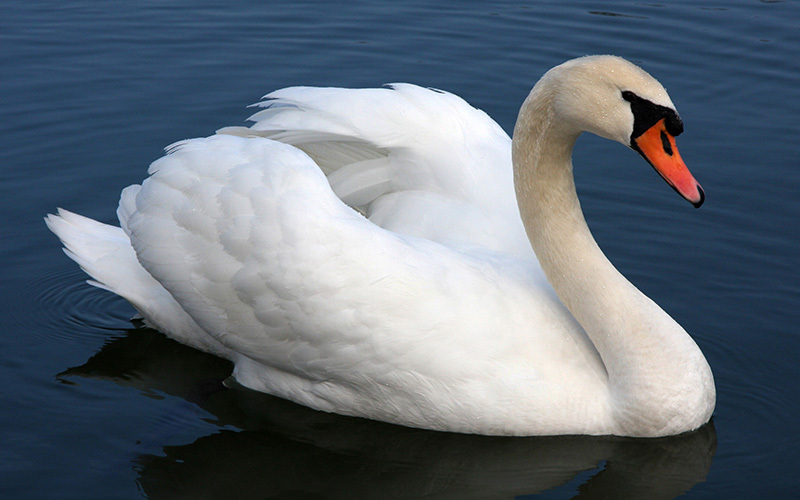 Measuring 125 to 170 cm (49 to 67 inches) in length, this large swan is wholly white in plumage with an orange bill bordered with black. It is recognizable by its pronounced knob atop the bill. Despite its Eurasian origin, its closest relatives are the Australian black swan and the South American Black-necked swan. They feed on a wide range of vegetation, both submerged aquatic plants which they reach with their long necks, and by grazing on land.